When you’re looking to be hired or to hire, ask yourself this question: What am I dangling—bait or a begging bowl? If your LinkedIn, Facebook, other social media profiles or cover letter describe yourself as “actively seeking IT employment” or “eager to consider new career opportunities”, read them again and judge whether they sound like enticements, or, instead, like an S.O.S. distress call. Likewise, depending on the wording of a job posting and reputation of the company, applicants may conclude that the employer or recruiter is desperate or that the job is unattractive, because the pitch seems too “needy”, too much demand and not enough supply on the hiring side. Although job seekers are less perverse than those dangling the jobs only for those currently employed, and don’t often agree with the other Catch 22 quip “I wouldn’t want to be a member of any club that would have me as a member”, they too may interpret eagerness negatively and mistake recruiter or employer enthusiasm for over-eagerness. For job hunters, the problem is the same: Sometimes—merely because of wording or tone, your self-pitch dangles the bowl, not the bait. Sometimes, it may be a matter of just one or two words, e.g., changing “actively seeking” to “interested in”. The problem doesn’t end there; it also surfaces in a mistaken approach to writing the rest of your profile, which I shall explain below. By “dangles the bowl, not the bait”, I mean that the presented pitch seems more like a plea, with begging bowl held out, than an enticement. As such, this sort of approach illustrates and constitutes one very wrong way to try to land a job, by needlessly overemphasizing the demand side of the applicant’s situation more than the supply side, understood as being what (s)he can offer—initially as tantalizing bait, to be followed up with a full-blown presentation of the “full bowl” of crunchy credentials. The same goes for employers and recruiters who try too hard to sell unsold candidates by unwittingly or unwisely begging rather than luring them. Sure, if a Fortune 500 company or even a corner grocery store posts “Staff urgently needed!”, it can work just fine and elicit a strong response from well-qualified applicants. But that’s because of either the solid reputation of the company or the obvious correctness of the inference that demand is strong and that the company can’t keep up. But staff may be urgently needed and job applicants may urgently need a job because nobody wants the job or the applicant, i.e., they are desperate and seem to be marketing their neediness more than their attractiveness. As I said, the “I really need this job!” approach can work, but then so can weeping to stop a bully—but in neither case often enough to make that approach a slam-dunk success. Best odds: around Christmas, just in case the one doing the hiring was moved by Dicken’s rehabilitated Scrooge. Sure, that can work (with a reformed or compassionate recruiter or employer) as a last resort. But as an opener? I think not. I recently counseled an executive whose company mission and platforms had become obsolete because of competing technology, precipitating his closing of operations. From his LinkedIn self-presentation, it was easy to conclude that he urgently needed a job and that getting one was a priority that trumped any thirst for a fresh challenge or adventure, or inherent desire to change career course. The tip-off was a top-of-the profile announcement of the blunt “currently looking for” variety, which, as I suggested earlier, can work when you—company or candidate—are alrady perceived as desirable for reasons independent of the pitch. Think of the “needy” pitch as being like an amplifier: If you are secure and independently, a priori attractive, like Apple or Microsoft, it can increase the intoxication of your target audience; but if you are not (either because you are unknown, seem vulnerable or are for any reason suspect), the “I’m needy!” approach is likely to amplify all such negatives. That kind of amplifier effect is not uncommon in many domains of life, e.g., crowding amplifies our pre-existing feelings about who or what is crowding us—amply confirmed not only by sociologists, but also merely by reflecting about how you would feel jammed into a Tokyo subway car full of Miss World beauty contestants when you aren’t one of them. Another mistaken approach to pitching is to “dangle the bowl” in a second sense, the first being to appear to be desperate and begging, as described above. This second misstep is to dangle the whole bowl of credentials, work history, traits, values, references, etc., in a forum and format that is supposed to post a teaser, e.g., a LinkedIn self-intro profile. “Baring all” at the outset may convey or create the impression of the fear—conscious or not—that one doesn’t possess or isn’t “enough”, much as a desperate or over-eager hiker, unsure of what is sufficient, might throw everything at hand at an approaching bear to chase or to feed it. That executive I recently counseled did precisely that—dangled the whole bowl in his posted social media profile, on top of dangling it as a begging bowl. Actually, in this instance, these were two sides of the same bowl, to the extent that the informational overkill (dangling the whole bowl) and the begging (dangling the begging bowl) were motivated by desperation and diffidence. The whole-bowl dangling isn’t necessarily motivated by such insecurities; it could be pride, extreme detail-orientation or a desire to be open through full disclosure, or to give employers or candidates what it is imagined they want that motivates such a career “storage dump” in one go. It can backfire in these scenarios too, and be misperceived as evidence of desperation or inadequacy (self- or reader-perceived). Alternatively, a scaled-down summary in bullet form of the five or ten best things about yourself or the job you are offering can work on social media sites or in a cover letter/handout (which, in any instance, should not be a complete autobiography of the Dickens David Copperfield “It was a dark and stormy night…” sort)—even if only to avoid information overload. Try these more constructive, gutsy approaches or come up with some of your own—anything, as an alternative to dangling a bowl. 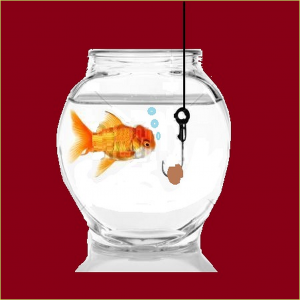 If you revise your pitch, and dangle bait instead, you may get precisely the one result you want with employers, recruiters or job candidates.